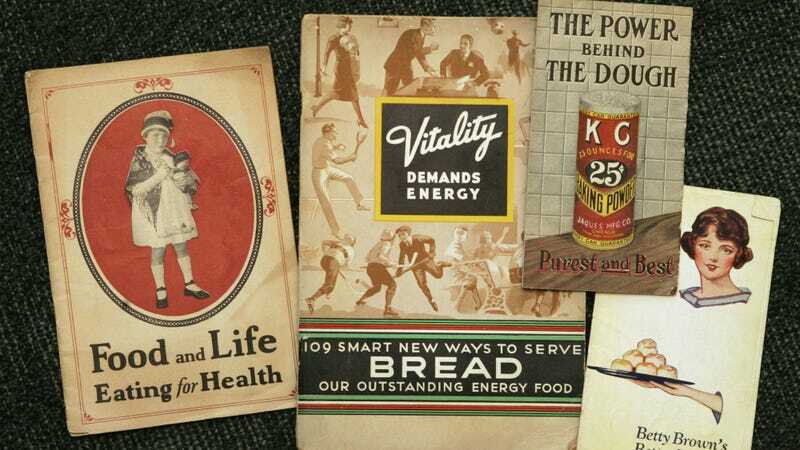 Note KC Baking Powder pamphlet bragging “Purest and Best.” Image via AP. But the market was also fiercely contested. Different companies had slightly different variations on a substance that did basically the same thing, leaving them to compete via other means. And they certainly did. Royal Baking Powder, which used cream of tartar, took the tagline “Absolutely Pure,” meant as an indictment of powders made with alum. The company played on consumer fears of adulterated food, Baking Powder Wars recounts, even lobbying to have alum varieties banned. And believe it or not, in Missouri, they succeeded—via bribery in the state Senate, according to the book. When the era’s muckrakers found out, it erupted into an enormous scandal. Still rather shaken by this unexpected revelation, I called Civitello to discuss. Our chat has been lightly edited for clarity and length. Jezebel: I saw the book and I realized that despite being somebody who bakes occasionally, like at Christmas, I actually had no idea what baking powder was. And I couldn’t believe I didn’t have a better sense of what this thing I’ve been putting in my food does. Linda Citivello: Nobody does! People still think it’s baking soda. So you’ll inform them. So what is it? What is this thing that we’ve been dumping in our cookies?What does it do? It’s a chemical leavener, as opposed to yeast, which is a living leavener. Yeast is a living organism. It’s an American invention, and it’s a shortcut, because we are all about speed, we are all about quick and easy. It’s also foolproof—it does not depend on the vagaries of weather, temperature, or skill of the cook. You see this in the first treatise in 1861 by Eben Horsford, who was a professor of chemistry at Harvard, where he says, this is going to be an equalizer. It’s going to reduce the skill level needed to produce baked goods. And it did. So it’s a democratic chemical leavening shortcut. Recipe pamphlet advertising Rumford Baking Powder, via HathiTrust. What was baking like before the invention of baking powder? It was incredibly time consuming, right? It was a day-long activity. You baked for the week. You had your laundry day, which took a day, you had your baking day, which took a day. In between you had children and you made everybody’s clothes and cooked the daily meals. So you would be baking with 20, 30 pounds of flour. I’m Italian American and we made holiday bread, and you took a five-pound bag of flour and you dumped it into a giant laundry basin and then you added dozens of eggs and sugar and stuff. And I remember kneading that when I was a teenager when I was doing sports, when I was strong, and you had to knead that for like an hour and let it rise for six and then shape it and then let it rise. It’s a multi-step process. Five pounds is really tough—I can’t imagine kneading 20 to 30 pounds of flour. It’s strenuous, manual, physical labor. And then it’s a brick oven in the wall, you had to get it to the right temperature, you had to scrape out the ashes. It was really complicated. By the end of the week you’ve got stale bread. Without preservatives, as a matter of fact, by day two and three, you’re gonna have bread that’s going stale. And gray, that’s nice. Some of these breads, like in New England, because wheat didn’t grow well—half rye flour, half corn. Rye is very low in gluten, corn has none. So you can put yeast in that and you can pummel it until the cows come home and you’re just not going to get much of a rise. It’s a very dense chewy bread. It’s substantial—you feel like you’ve eaten something and it’s very nutritious. But it’s got a crust on it that—old people, babies, not going to work for them. A lot of recipes call for soaking bread in chowder or something like that. When you get to the end of it, if it’s stale and it hasn’t all been consumed, you can use the crust to scrub the walls. So would you rather have that or biscuits you can bake in 15 to 20 minutes that are hot and fresh and fluffy? So when and where does baking powder emerge? The prototype of baking powder is in 1796, in Amelia Simmons’ American Cookery, which is the first cookbook written by an American, published in America. Before that we had cookbooks that were written in England. They might have been published here, but they were not American. She had something called pearlash, which is vegetable or wood ashes that have been cooked down and have leavening properties and are also caustic. At one point they said mix it with water and you can use it as a solvent or you can use it as a cleaning liquid but don’t leave it too long anywhere or it’ll strip the paint off the floorboards. Amelia Simmons was in Connecticut; the book was published in Hartford. You’ve got this New England band of women experimenting. One of the things they experimented with was smelling salts. Nobody today would say, oh, I’m going to go into my medicine cabinet here and see what I can add to this cake. It’s not as outrageous as it sounds, because in Germany they’d been using hartshorn, which is ammonia. Ammonia has mild leavening properties. And sal volatile, or smelling salts. The problem with ammonia for baking is it’s ammonia. If you don’t bake it right, it will leave a taste of ammonia. Which is urine. It smells like urine. Which is why now it’s usually just used in small crisp things, because it’ll evaporate quickly. If you’ve got something that’s dense and high in fat that will hold the taste and the aroma, and if it doesn’t cook all the way through, your kitchen smells like urine. This is a problem. So women were looking for something better. Some of the early things they tried interfered, they said you can’t use anything acid with this. You can’t use orange juice or lemon peel, it will negate it, everything interferes with everything. This tastes like ammonia, that one strips the paint off of floorboards. Give me something better. Women had gone as far as they could go and then scientists had to take over and cream of tartar and baking soda show up in the 1840s. That’s another mineral. It’s inert, it doesn’t care about temperature the way that yeast does. But cream of tartar and baking soda, again, had problems. If you didn’t put the cake in the oven right away—Catherine Beecher says you have to get it in immediately and you might have to try a couple of times. You can’t mix the batter and then go oh, where’s my pan? That’s another drawback. Then you get Eben Horsford at Harvard, who’s got five daughters who are probably in the kitchen a fair amount. His treatise in 1861 on bread making—bang bang, 30 or 40 minutes, foolproof, there you go. That’s it! Absolute revolution. So it basically immediately changes things. The problem then was, how do I store this stuff? Baking soda reacts with liquid. That’s like a third-grade science experiment. If you live where it’s damp, like in the New England, how do you keep the damp from getting to this, or getting to your cream of tartar and the other things they were using, and just rendering it useless. What Horsford came up with was genius, which was corn starch. Put in a buffer that will keep the two chemicals from reacting in the can or the bottle and blowing it up. Which had happened. And will also wick away the moisture. Genius. We see experimentation right up until 1900 and even after that, people were making their own proprietary baking powders, lots of little local places through out the United States. There were 543 baking powder companies in the United States. A lot of these would be like, if you had a little grocery, a little country store. You’re near a train. You can get these minerals brought in and all you needed were some cans—by then we had a good aluminum—and a label and you could have your own label of baking powder. It’s not until the 1930s and the Depression when the national market really takes over. The title of your book is Baking Powder Wars. You tell this story of incredibly intense competition over this market. How do you get that level of vicious cutthroat competition over something that’s fairly straightforward? There was competition in all areas. There still is! Industrial espionage and dirty tricks are nothing new. But in the 19th century, some of the biggest competition was between the old artisanal ways of making foods and the new industrial way, which was cheaper, faster, and had economies of scale that you didn’t have with artisanal products. The war was going on in chocolate. You had the new industrial process and older companies like Cadbury who said our chocolate is pure, like Royal Baking Powder. If you’re on the purity bandwagon, if you’re saying all these other chocolates or baking powders that have these ingredients aren’t pure, you can’t then go and make that product yourself, because you’ve committed yourself to your slogan. All you can do is fight it in advertising. And one of the ways advertising spread was you had thousands of newspapers across the United States. You had small newspapers and then you start to get national magazines by about 1900 because of, again, the railroads. Hundreds of pages of advertising in things like the Sears catalog, the Montgomery Ward catalog, so you’re getting advertising. These small local newspapers couldn’t stay afloat just on local revenues, so they took in revenues from national companies like Royal Baking Powder. Butter was notorious for this. When margarine came into existence in the 19th century, the butter industry in New York state said no, we don’t want this competition. This is poison, this is terrible stuff, and it can’t look like butter. It’s white—they used to add coloring to it to make it look like butter—they wanted it dyed red or purple or black or some hideous, unappetizing color. So people who used margarine, even into the early 20th century, it came with a little capsule that then you mixed in so that it would look like butter. This was where the competition comes from. You’ve got vast new economies of scale products and you’ve got the artisanal method. Of course now, we’re going back in many ways to these smaller artisan ways of making things. It seems like there’s a gold rush—they’re inventing a lot of stuff and spreading out and it’s just a huge fight. Right, right! And because you’re in a laissez faire economy, there is no government agency or anything at that time, in the 19th century, that’s overseeing or has the power to do anything for advertising or in print. You can make any claims you want and it’s straight caveat emptor. You’re the buyer—it’s up to you. And conversely, if you have the money, you can buy anything. One of the arguments for I should be able to buy whatever kind of baking powder I want is they’re selling these nice little personal kits of hypodermics so if people want to inject themselves with morphine. If that’s okay, they really ought to be able to use whatever kind of baking powder they want. There was heroin in cough medicine. It was interesting too how you get a lot of early sponsored content. All these companies are making their own cookbooks extolling the virtues of baking powder. You have to! You have to educate the public in how to use your product. Women were doing that in cookbooks also. I think I have a page from one where she has a recipe using yeast and then right below it is the same recipe using baking powder. A lot of people are still leery. Then the baking powder companies would have demonstrations, and they’d go door to door demonstrating. But you have to educate the public in the use of your product. Proprietary cookbooks were one way to do that. And the flip side—you have all these companies trying to educate the consumers that their competitors are selling poison. Right down to the level of the company that tries to get competing forms of baking powder banned and succeed in Missouri by allegedly buying the state legislature. Only the state Senate! Wasn’t that mind-blowing? The other thing that blew me away there in that story is the Missouri House was basically honest. Nobody bought them. And they were responsive to the consumer, who were signing petitions by the thousands saying “give us back our baking powder! Why do we have to spend more money on this other stuff!” The House kept voting to repeal this law. At one point they were just so fed up they passed a resolution censuring the Missouri Senate. You have a bicameral legislature and one house turns on the other house. And what I keep coming back to is—again, this is about baking powder. It seems so incongruous. It’s this boring thing in my cabinet that I don’t think about. It brought down a state government! The lieutenant governor had to resign. It was a huge scandal.